India is a country rich in culture, history and religious traditions. A great example of its religious influences is the beautiful Jama Masjid, India’s largest and most beautiful mosque. It was built in 1644 by the Mughal emperor, Shah Jahan who was the same emperor who built the very famous Taj Mahal in Agra. Jama Masjid’s grand courtyard measures an astounding approximate of seventy-five meters by sixty-six meters. It can accommodate 25,000 devotees in prayer at a time. The courtyard can also be accessible on three sides. From the outside, visitors will be amazed by its majestic façade of three splendid gateways, four intricately-designed towers and two minarets. A minaret is a tall free-standing structure usually present in Islamic architecture topped with an onion-shaped object. 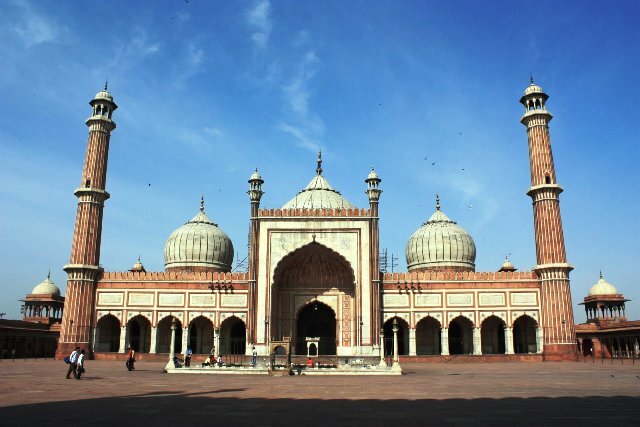 There are also several tombs of prominent rulers in the Jama Masjid complex. On eastern side entrance of the courtyard is the mausoleum of Sultan Ahmed Shah. The Jama Masjid is a fine reflection of the convergence of Hindu and Mughal architecture. The ornate and intricate columns with its spacious courtyards define elegance and majesty as its well-balanced cornucopia of towers, minarets and domes give a feeling of grandness and serene grace. Its sheer sophistication is truly a wonder. The testament of its sound structure and engineering is also evident in its longevity. The great architectural marvel has been enthralling people for more than 300 years now. Jama Masjid was built using marble and red sandstone which was a favorite building material during the era it was built in. It took more than 10 years and 5,000 artisans to complete this marvelous structure. Several pillars with ornate Hindu designs support the structure while the courtyard is paved with white marble. In the middle of the structure is a pool which provides serenity as the water feature prepares the visitor for a calm spirit upon entering. A flight of stairs leads to the south and north entrance where merchants set up their wares. This particular area comes alive at night with food stalls teeming with people. The red fort on the other hand, faces the main entrance on the eastern side as emperors were believed to have used this entrance in the past. Jama Masjid is also known to house the Prophet Mohammad’s relics like the Koran written on deer skin, his sandals and red-bearded hair. Jama Masjid is truly a wonderful tourist site to visit in India. It lies in the old sections of Delhi, located in the busy intersection of Chawri Bazar Road. The large mosque is easily accessible through various modes of transportation in the city. Because Jama Masjid is an active mosque where people of Islamic faith converge, it is closed to visitors on a certain time period during Fridays which is the holy day of prayer for the Muslims. There are fees collected for tourists carrying cameras. Because footwear needs to be left at the entrance, fees are also collected by the person looking after them. The best times to visit are said to be during October and March. While most mosques welcome non-believers, it is advisable to give the Jama Masjid proper respect. Taking off your footwear and covering for the head may be required. Most importantly, make sure to dress conservatively.